Since I arrived I had a very good experience of Cape Town .This town is very bustling and there are a lot of things to do. I want to emphasize on two days that have left me with a strong memory. The Mandela’s Day and the visit to Table Mountain. I came to Cape Town to do a one month internship with the car hire company: Around About Cars. This companies management and staff have big hearts and don’t forget those who are in deprivation. Therefore, for the Mandela’s day my colleagues and I served about 200 rations of fantastic and free soup. Mandela Day is an annual international day in honor of Nelson Mandela, celebrated each 18 July (Mandela’s birthday), and the purpose of this day is to spend 67 minutes helping others. During the morning we made soup in a huge pot, and in the afternoon we installed the pot in the street, just in front of the office. Obviously, all the poor people, the hobos of the local area came to get their cup of soup and roll. It was a success because we spent our time helping the other people instead of staying in an office all day. 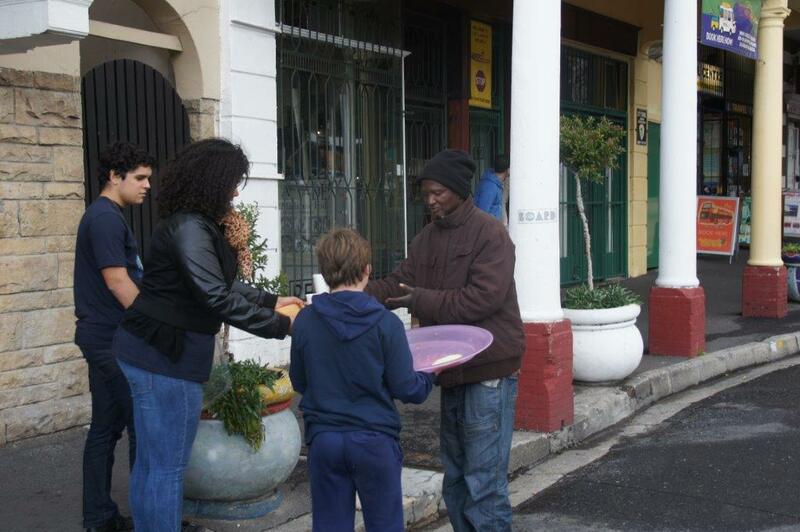 We went to one of the famous streets of Cape Town namely, Long Street and we found here many people who loved our soup. We were happy because we could help people in good mood, and above all we could give a little happiness to the poor. It was one of my best experiences in Cape Town. Nevertheless, what struck me was the high poverty of the people. Indeed, as soon as we installed the pot, many homeless with their cardboard appeared and just wanted to eat, but they also thanked us warmly and we saw a lot of gratitude in their eyes. Another important point of my stay is Table Mountain; it is a must-see for all the tourists. Unfortunately I did not have time to hike to the top of the mountain with my friends; therefore we took the cable car. When I arrived at the top I was stunned by the vistas. I took a lot of pictures. We were very lucky because the weather was splendid and no clouds in sight. I could see Robben Island, The Cape Town Stadium and Camps Bay. It was wonderful, so beautiful that we decided to wait for the last cable car to go back down and to have the opportunity to see Cape Town at night. Indeed, we did that and it was fantastic even if it was very cold. Finally, I want to speak about another point, it’s true, less important: nightlife in Cape Town. During my stay I could go out quite often, and I want to say that the nightlife in Cape Town is very active, there are plenty of bars and nightclubs, furthermore the nightclubs are often full and have very good DJ’s. So, it is a good place to go out, travellers will be happy. Cape Town is a very beautiful city with many things to do, beautiful places such as Waterfront for example and wonderful landscapes, such as Table Mountain, which is the 7th Wonder of the World. And I will definitely come back and bring my family with and explore South Africa more!